At Mountain Crawl Space, Inc., we're proud to provide only the highest-quality cast-iron Zoeller® sump pumps to our customers. We offer free Zoeller® sump pump estimates in the Colorado area, including Grand Junction, Montrose, Clifton and nearby. Why do we stand by Zoeller®? Because our full-time Research & Development department, along with hundreds of CleanSpace® waterproofers worldwide, have carefully examined and tested sump pump models of all types. Our research, combined with more than 20 years and thousands of sump pump installations, have all pointed to one fact: Zoeller® provides the best pumps on the market. At Mountain Crawl Space, Inc., we install the powerful Zoeller® M53 and M98 models. Combined with our battery backup system, these pumps make for a powerhouse sump pump system that is up to the job of keeping your crawl space dry. Other models are available for unique circumstances. Zoeller® provides their sump pump systems throughout the United States, Canada, Mexico, the United Kingdom, and throughout the world. 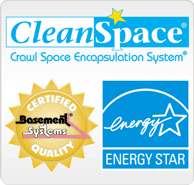 They are the best sump pump company in the world, and the only one for CleanSpace®...and for you! CleanSpace®, Inc. is an authorized Zoeller® Pump distributor.